For all skating moms out there looking for an affordable alternative to the expensive skating pants in store, here is a picture of our yoga pants pattern on ice! 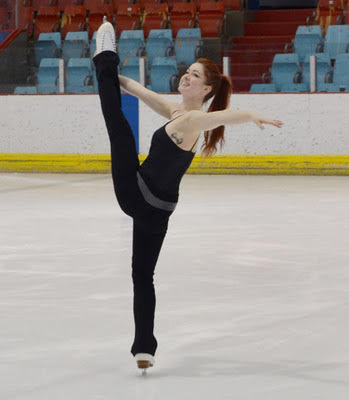 Amélie wears her Jalie skating pants with her 2674 leotard (an empire-waist dress without the skirt). It is the leotard we made for the 3025 Skating Dress Pattern cover. The pants hem was not altered to cover the skate and this is the original length. You can use regular Lycra or a warmer stretch fleece. The two-piece outer waistband allows for fun color blocking (read "using those pieces of Lycra in your stash that would be too small for anything else!"). If your daughter wants a spiral applique around the leg, take a look at the first illustration in our 3026 instructions (we sew a spiral on one sleeve) to see how it's done :) You only have to make sure the diagonal lines match when you sew. It's as simple as that!